Many things can go wrong when moving – stuff breaks, help is late, or the kids decide this is the perfect day to throw a tantrum. While you can never know for sure what the day will have in store for you, here’re some items you should have on hand to help you get through the day moving-drama free. Don’t pack them all away, keep a box with basics around for moving day: paper towels, wet wipes, a cleaning spray, a broom/ vacuum cleaner, and tons of trash bags. Chances are you’re going to need most – moving is often messy, and you may also want to do a final tidying up before you leave. Other items that may come in handy are spackling paste and magic erasers – then you can fix scratches on baseboards or holes in the walls and be sure to get your security deposit back. Moving it’s stressful enough, don’t make it even more so because you’re hungry. By moving day, chances are you already packed away the food from the pantry and the fridge, and there’s no time to grab a bite. You can, however, prepare a box with your favorite snacks ahead of time. If friends and family are helping you, don’t forget about them either. You’ll be surprised how much more energetic they are after a couple of slices of pizza or some refreshing drinks. It’s not going to take more than a few boxes before you forget what went where! Make sure to label each one properly. It’s a good idea to write down the contents, as well as to what room of the house the box belongs. That will make it easy for you to find stuff before you unpack, and the movers will know where to unload them. 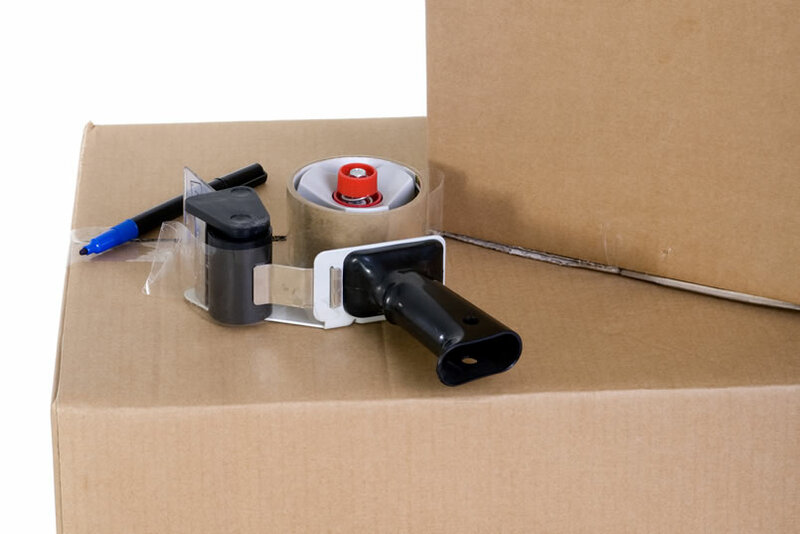 To avoid damage to your belongings and injuries to yourself or the moving crew, don’t forget to label boxes as “fragile” when needed, or “heavy” when they are over 40lb. If you packed belongings for moving in bags or other containers, label those carefully for the same reasons. All that effort you put into proper packing will account for nothing if the boxes open during transport to spill their contents. Get some quality tape that actually sticks and a good dispenser. Cutting tape with scissors is neither fun nor productive. Tape everything carefully: boxes (don’t forget to reinforce the bottom! ), cabinet drawers and doors, wrapping material around fragile items, etc. Save your back and move heavy items with a handcart or other wheeled device, like a skateboard, or even a potted plant mover. Balance them properly, and when in doubt, leave the heavy lifting to the movers. Just in case! A swiss army knife will surely come in handy, from last minute furniture disassembly to opening the champagne when done! Don’t forget the things you need to get through the day – phones, chargers, laptops, medicine, checkbooks, cash, keys, etc. You’ll need them for moving day and likely when you get to your destination. Need help moving? Let our professional movers, packers, and relocation specialists help make your moving day the best it can be. Contact us today for a free moving quote on our website or by calling (503) 678-9750.